The MCP1256, MCP1257, MCP1258 and MCP1259 are inductorless, positive regulated charge pump DC/DC converters. Generating a regulated 3.3 V output voltage from a 1.8 V to 3.6 V input, they are specifically designed for applications operating from 2 cell alkaline, 2 cell Ni-Cd, 2 cell Ni-MH, or one primary lithium coin cell battery. These devices automatically switch from 1.5x to 2x boost operation modes to maintain high efficiency. In addition, at light output loads, the MCP1256 and MCP1257 can be placed in a sleep mode, lowering the quiescent current while maintaining the regulated output voltage. Alternatively, the MCP1258 and MCP1259 provide a bypass feature connecting the input voltage to the output. 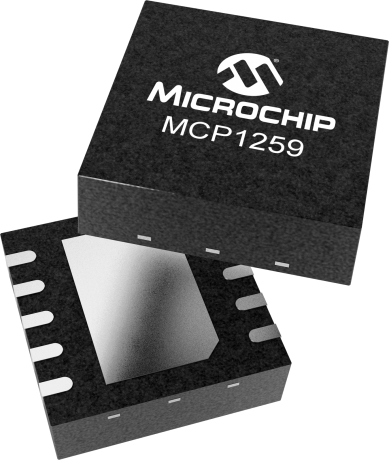 This allows for real-time clocks, microcontrollers or other system devices to remain biased with virtually no current being consumed by the MCP1258 or MPC1259. In normal operation, the charge pumps switch at a fixed 650 kHz, avoiding sensitive IF bands, and the output voltage ripple is below 20 mVP-P at load currents up to 100 mA. The MCP1256 and MCP1258 feature a power-good output that can be used to detect out-of-regulation conditions. The MCP1257 and MCP1259 feature a low battery indication that issues a warning if the input voltage drops below a preset voltage threshold. Extremely low supply current and few external parts (4 capacitors) make these devices ideal for small, battery powered applications. A shutdown mode is also provided for further power reduction. The devices incorporate thermal and short-circuit protection. The MCP1256/7/8/9 Charge Pump Evaluation Board is an evaluation and demonstration tool for Microchip Technology’s MCP1256/7/8/9 Regulated 3.3V, Low-Ripple Charge Pumps with Low Operating Current SLEEP Mode or BYPASS Mode. The design provides for dynamic versatility.